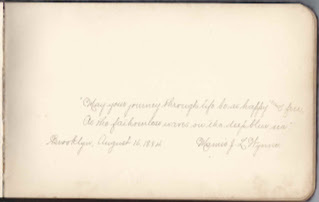 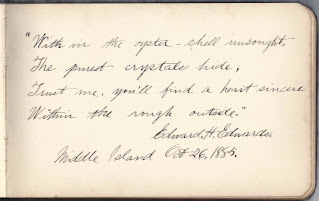 1880s autograph album of Marianna Edwards of Middle Island, New York. 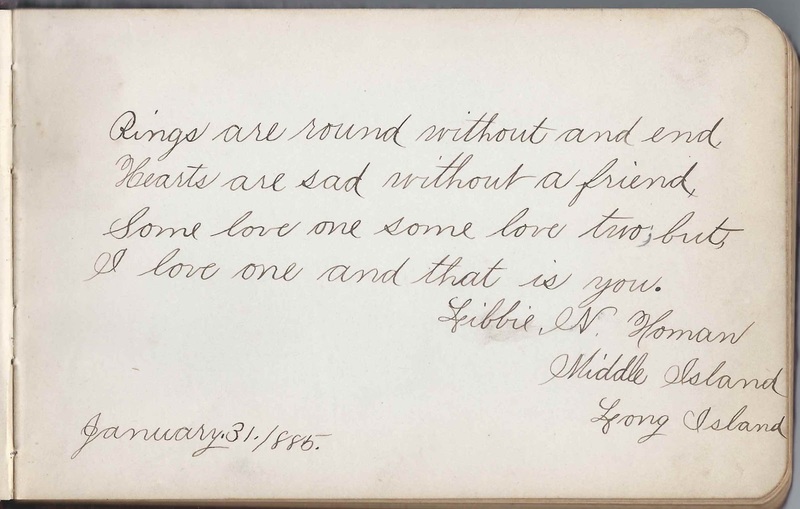 See images of all of the pages at the end of this post. 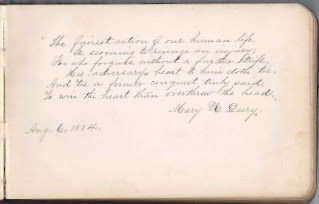 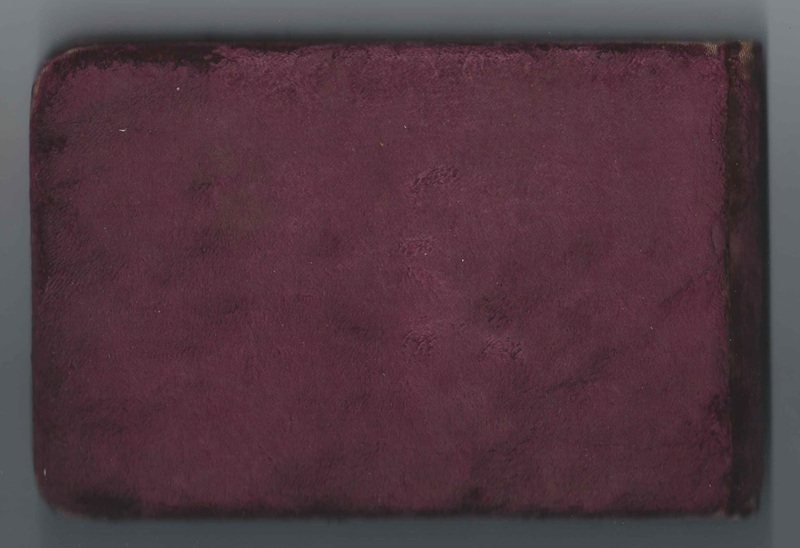 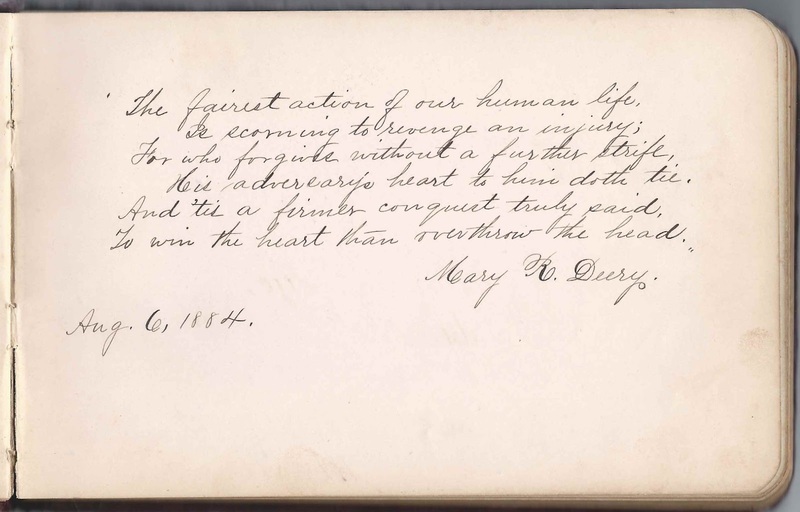 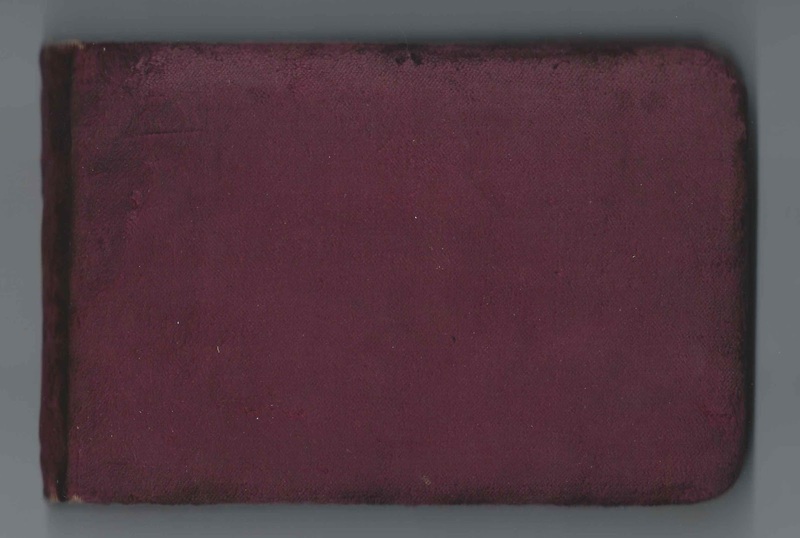 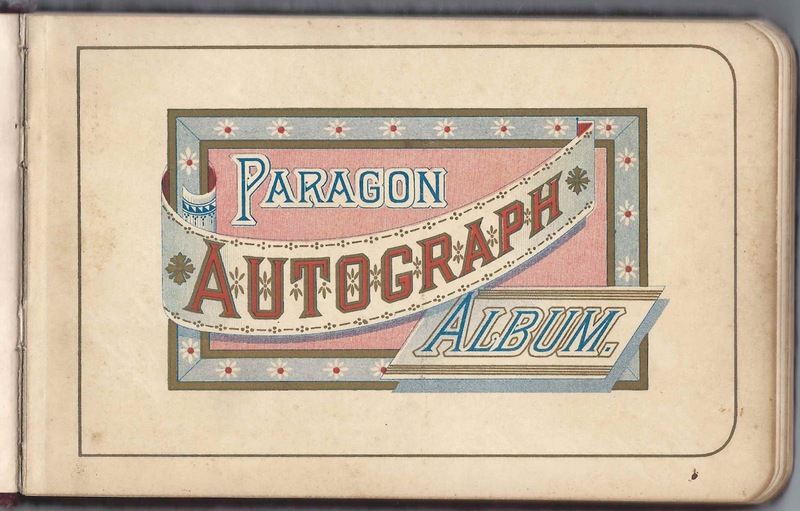 See another post that features an album that Marianna kept during the 1870s. 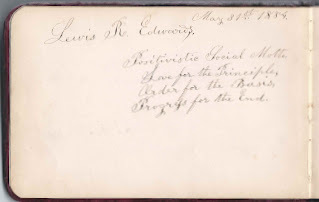 These two albums, plus a Connecticut one and two 19th century Phillips Exeter Academy graduation photographs, came to me from a friend made through an heirloom reunification. 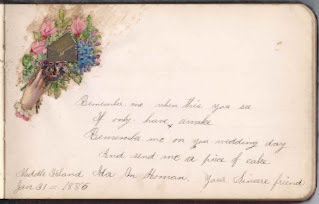 He found them in an antique shop and is hoping that a descendant happens by. 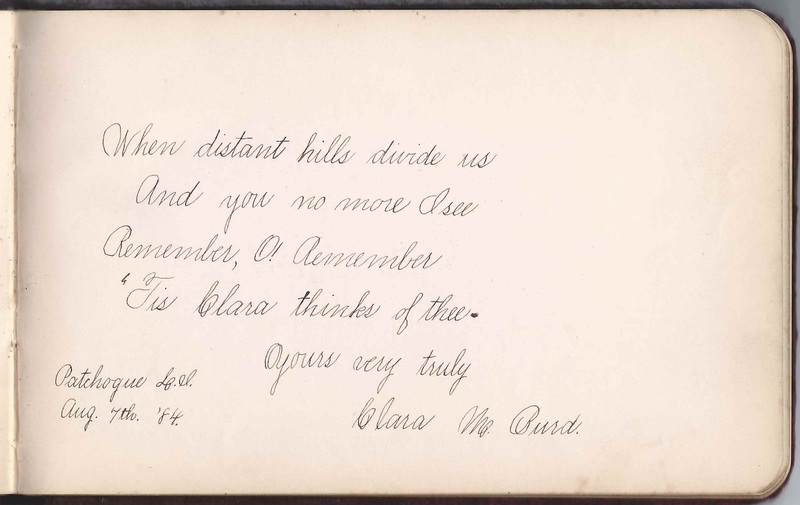 The album measures approximately 8" x 6" and contains the sentiments of 22 of Marianna's relatives, friends and students. 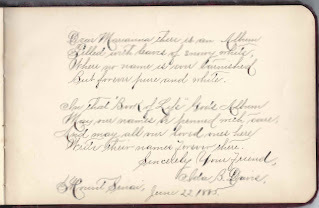 An alphabetical list of the signers, with any residence and school affiliation information, appears at the end of this post. 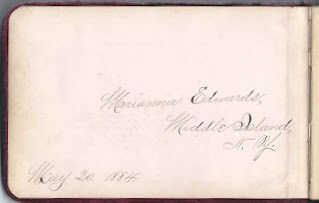 Marianna Edwards was born about 1853, presumably at Middle Island, New York, the daughter of D. Floyd Edwards and Sarah A. 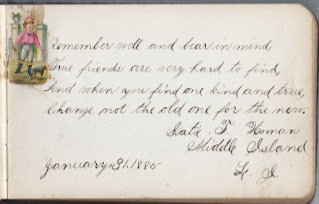 (Hawkins) Edwards, "Sally". 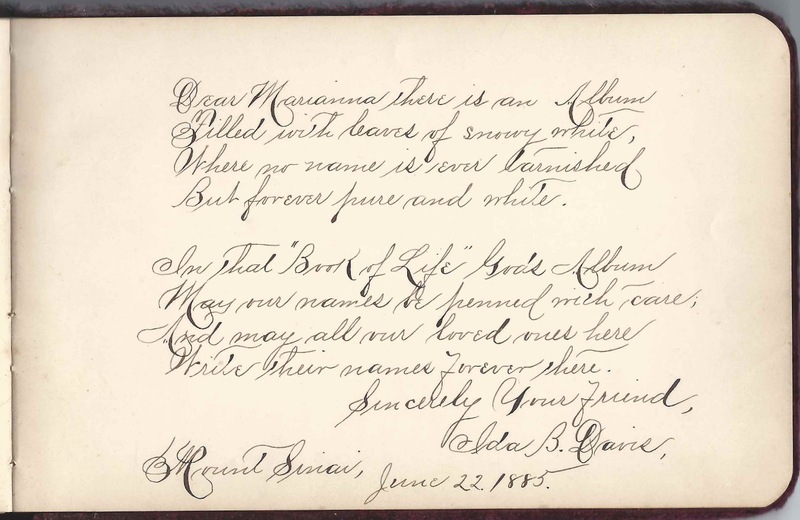 Marianna's parents inscribed pages in her earlier album. 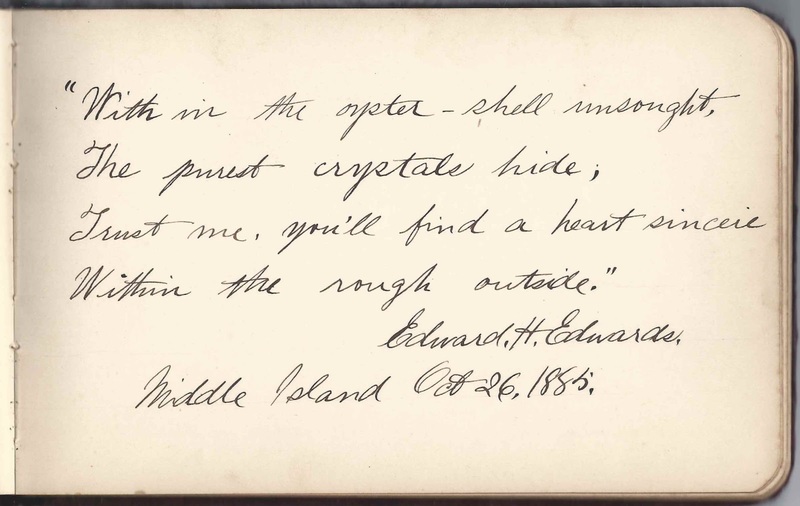 There's an interesting history and photograph of the Edwards House at Middle Island, New York here. 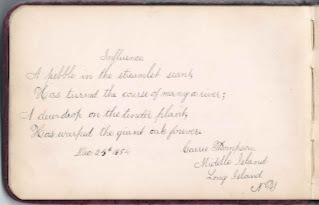 It mentions that Jonathan Edwards acquired 300 acres at Middle Island, New York, after serving in the French and Indian War. 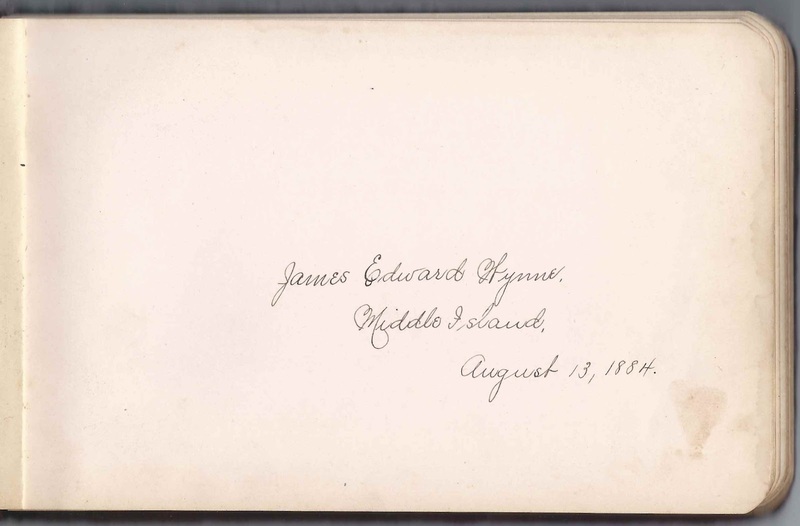 The farm passed down to his son, and then to his grandson, both named Jonathan, before passing to his great grandson D. Floyd Edwards. 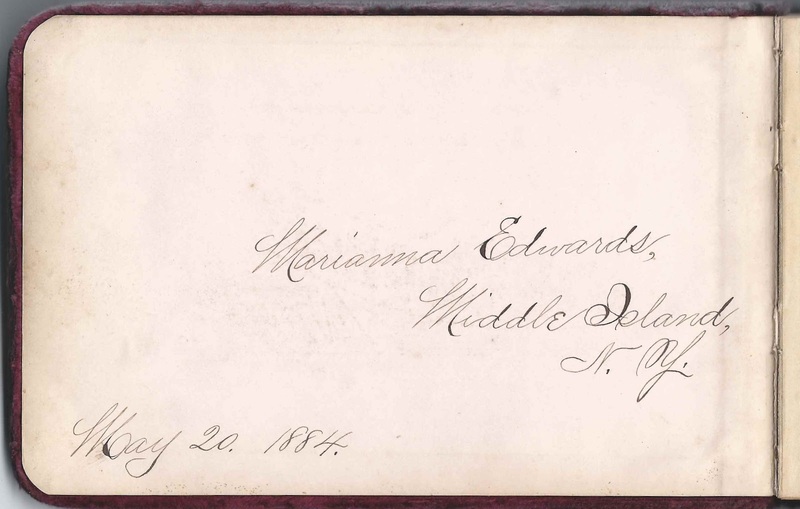 The last Edwards to live in the house was Marianna's brother Victor F. Edwards. 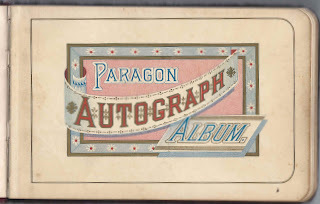 All three of Marianna's siblings signed pages in her earlier album. 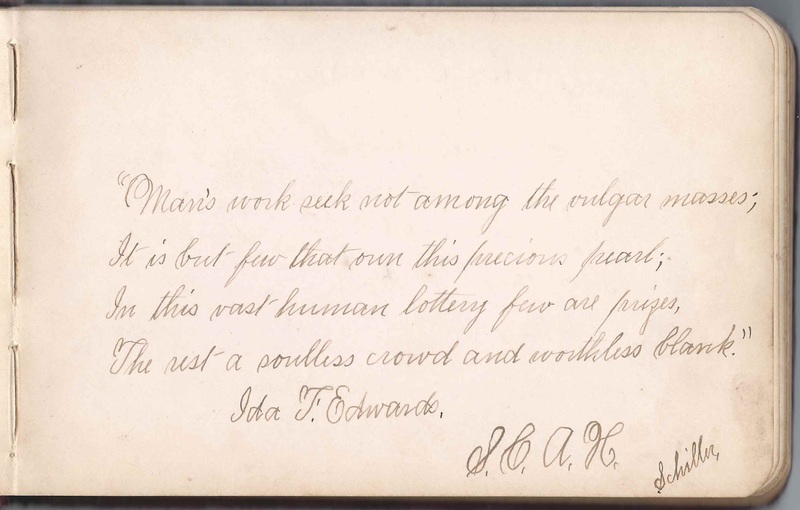 In this one, Adelia Charity Edwards and Victor F. Edwards did not. 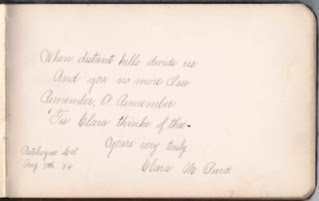 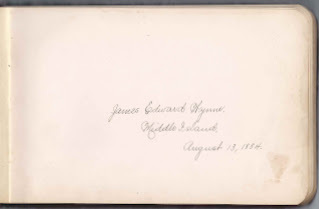 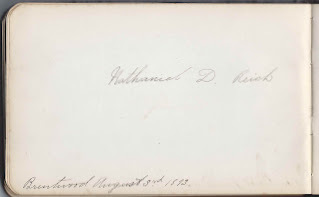 However, Marianna's younger sister Ida F. Edwards and younger brother Edward H. Edwards signed pages, Edward at Middle Island, New York, on October 6, 1885. 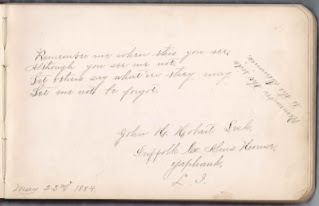 Ida didn't date her page but mentioned this acronym: S.C.A.H. 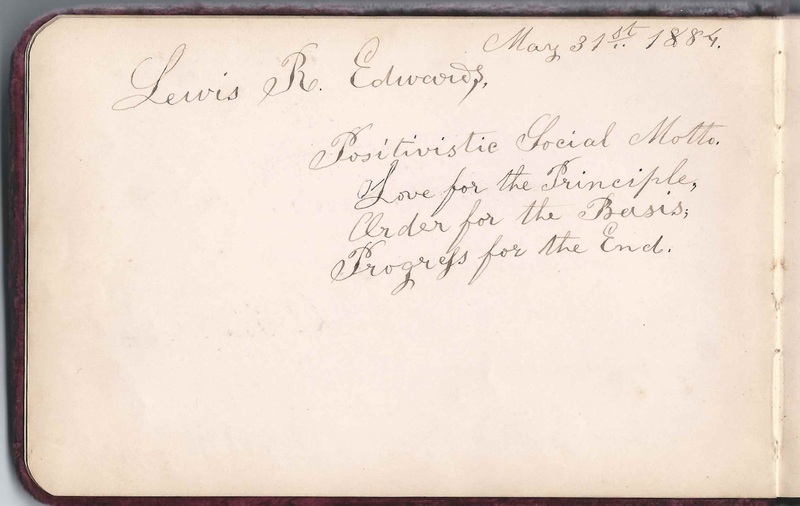 Also signing in both albums was Lewis R. Edwards, brother of Marianna's father, D. Floyd Edwards. 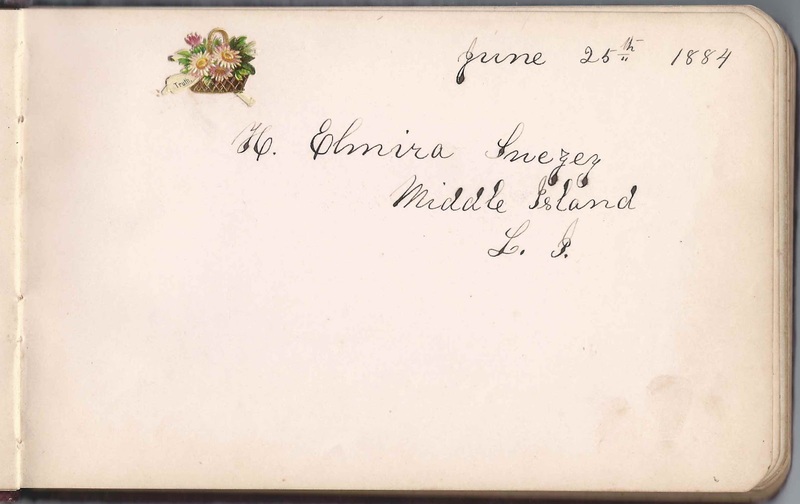 Marianna was working as a school teacher and living with her parents at the time of the 1880 Census. 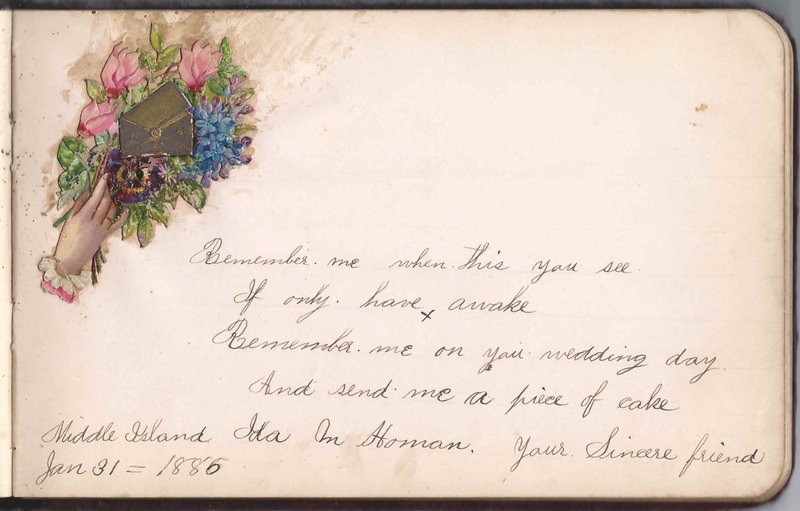 According to WorldCat, the town of Brookhaven holds the register she kept as a teacher during the 1877-1878 school year at District 17. 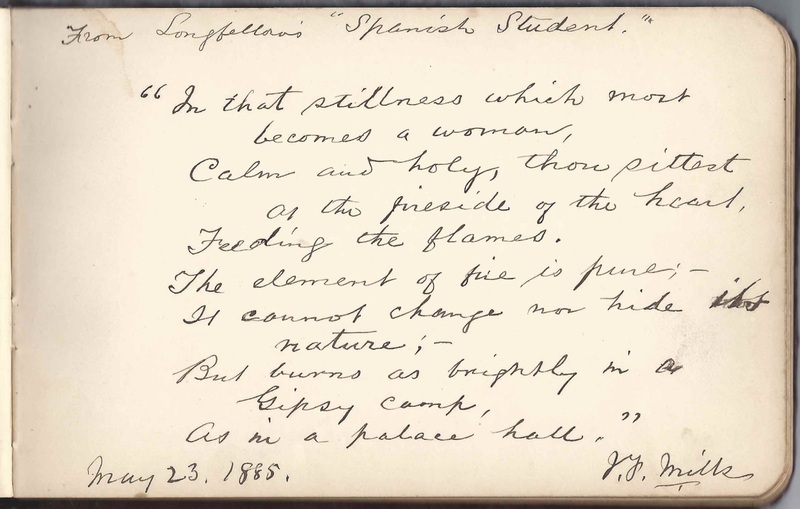 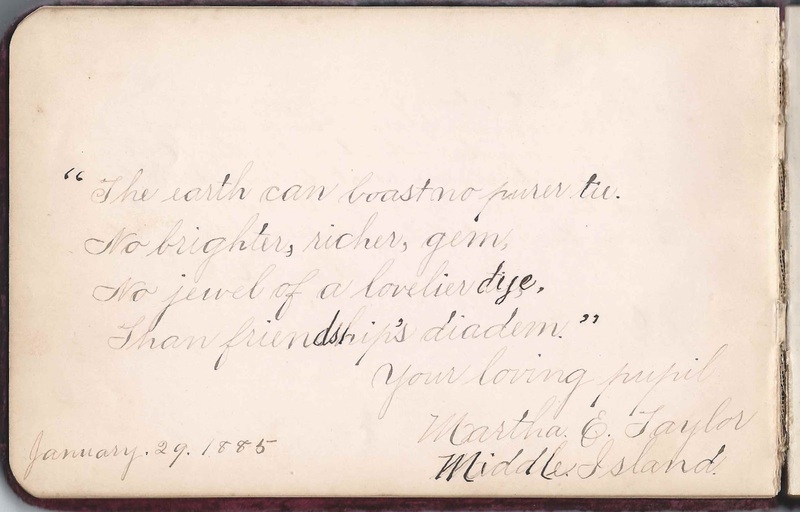 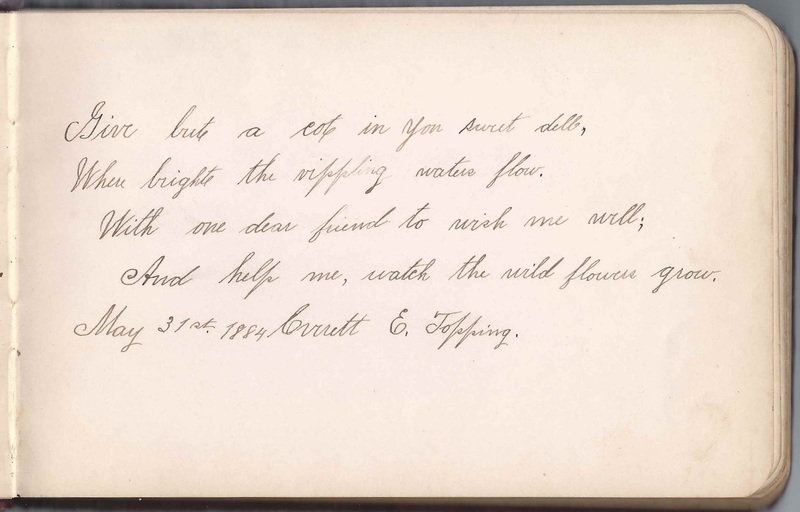 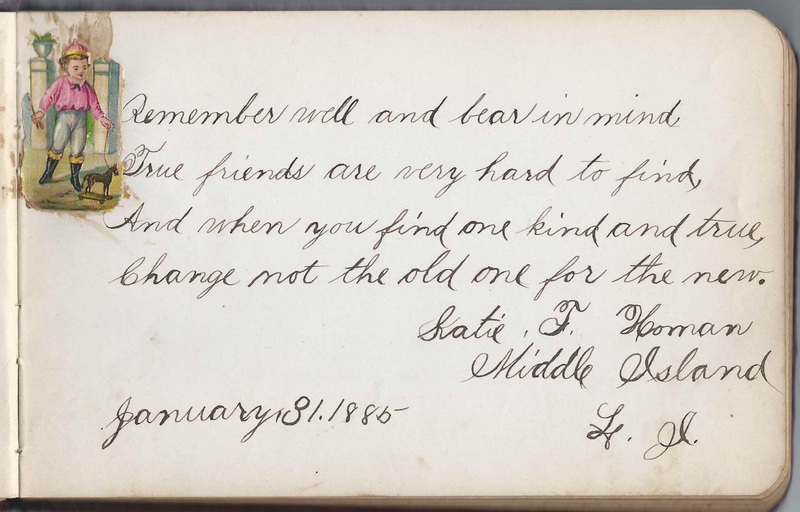 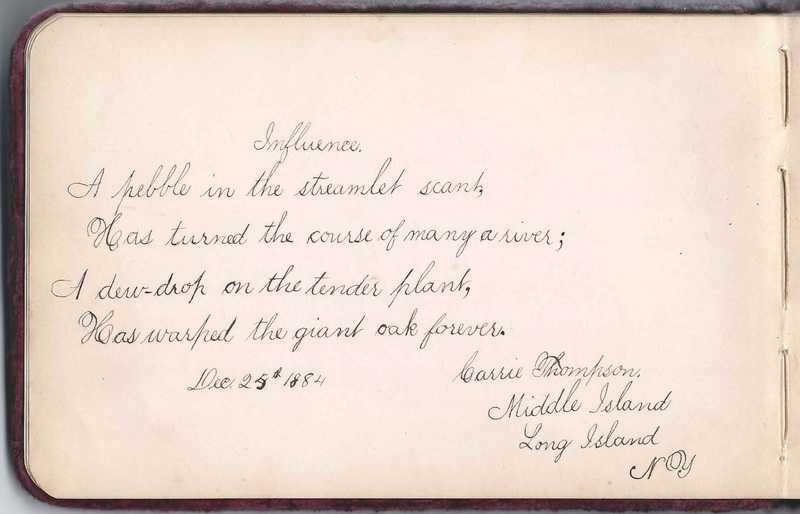 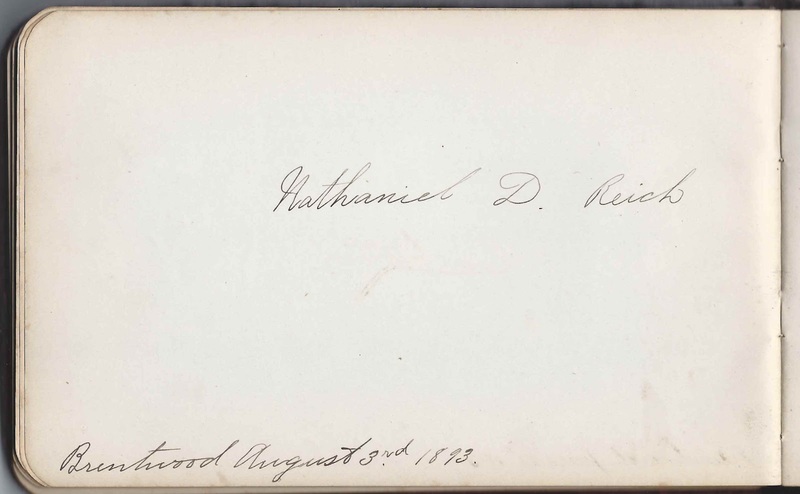 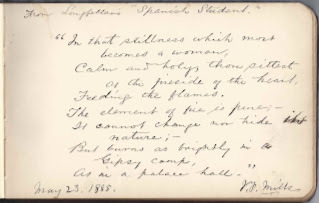 Marianna's student, Martha E. Taylor of Middle Island, New York, inscribed a page on January 29, 1885. 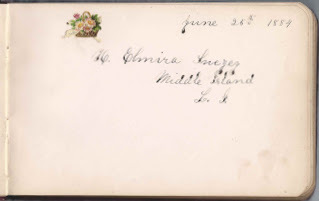 According to this site, on 3 May 1887 at Middle Island, New York, Marianna Edwards of Middle Island and John Davis of St. Johnland, New York, were married by Rev. Powell. 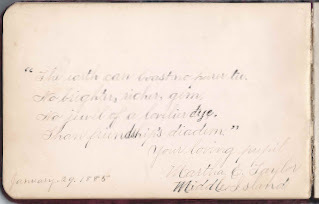 Sadly, Marianna (Edwards) Davis died at age 45 on 24 February 1898. 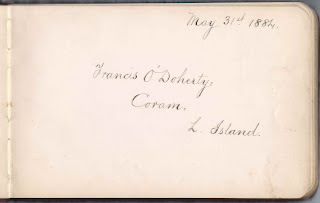 She's buried with her parents at the Union Cemetery at Middle Island, New York. 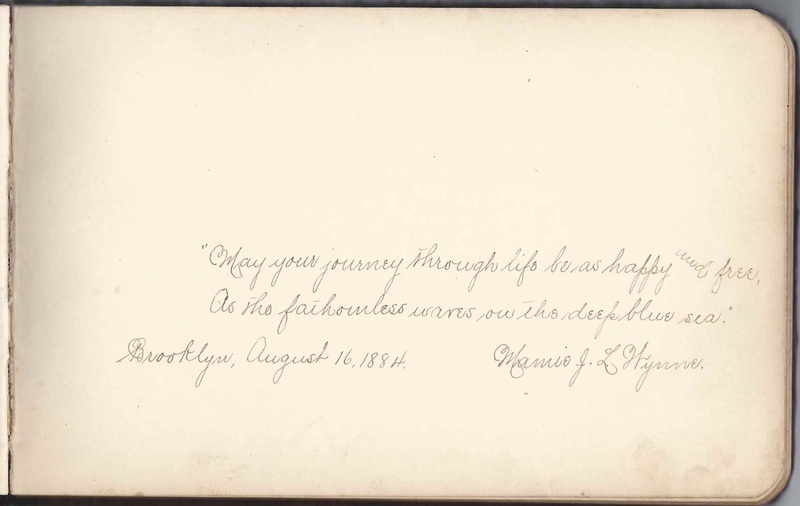 Facing pages were signed by Adeline A. 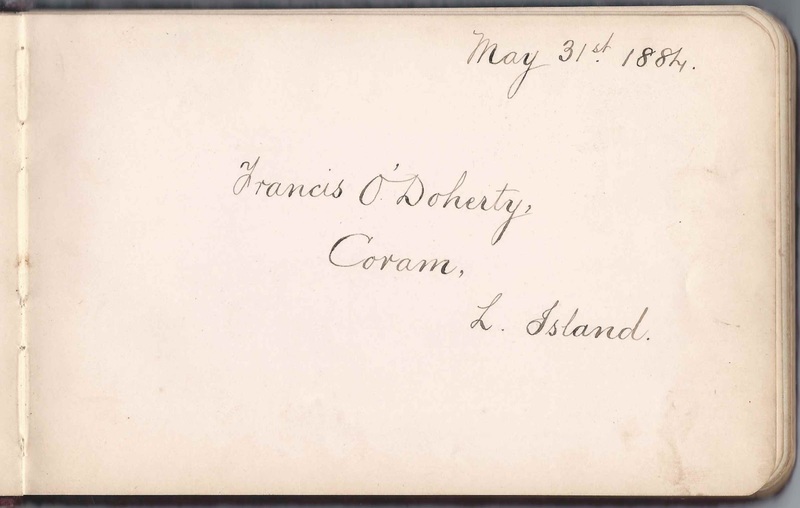 (Bennett) Leek, "Addie", and her husband John H. Hobart Leek at the Suffolk County Alms House, Yaphank, New York, on May 22, 1884. 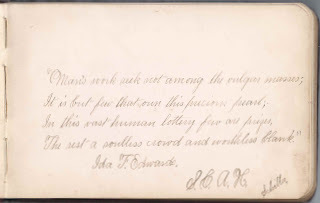 Ida F. Edwards, S.C.A.H. ; Marianna's younger sister. 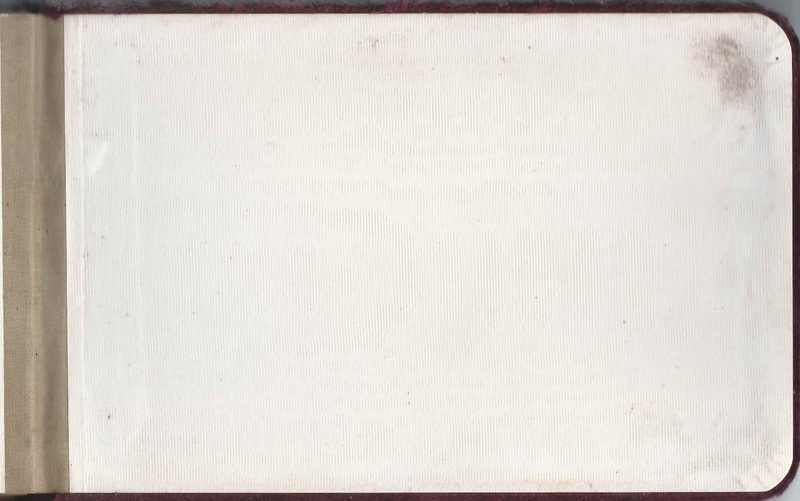 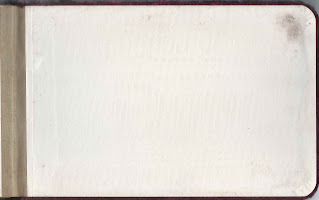 Addie A. Leek, signed at Country House, Yaphank, New York, on November 15, 1884. 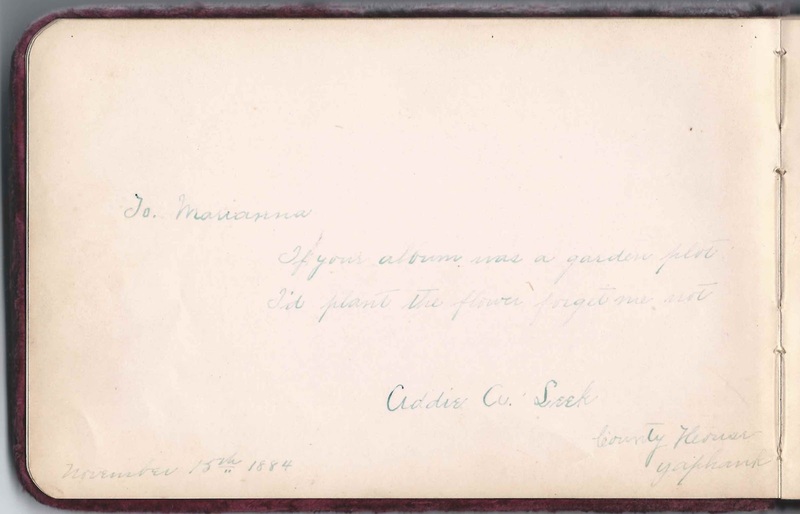 She was Adeline A. 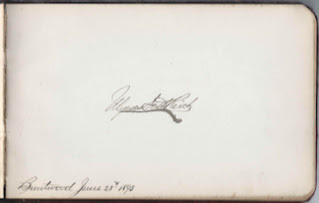 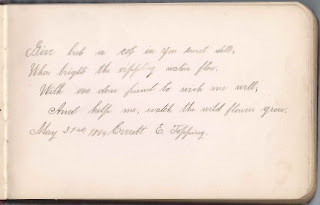 (Bennett) Leek, whose husband John H. Hobart Leek signed the right facing page. 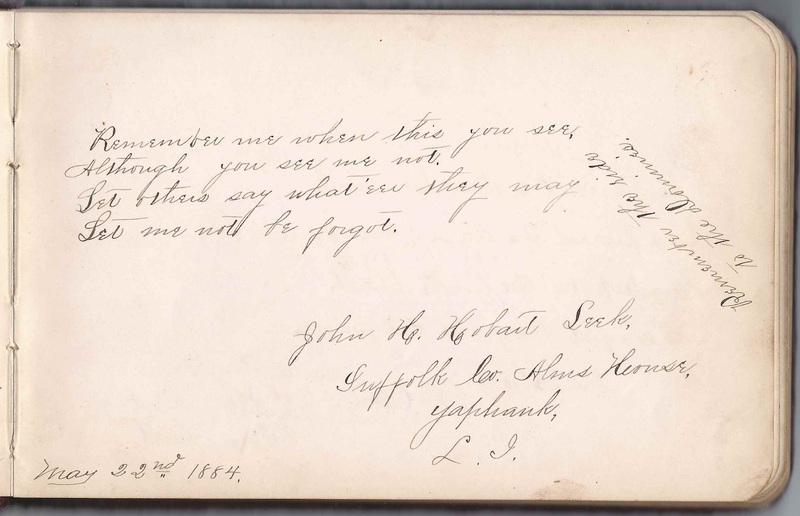 John H. Hobart Leek of Suffolk County Alms House, Yaphank, New York, signed on May 22, 1884; his wife Adeline A. 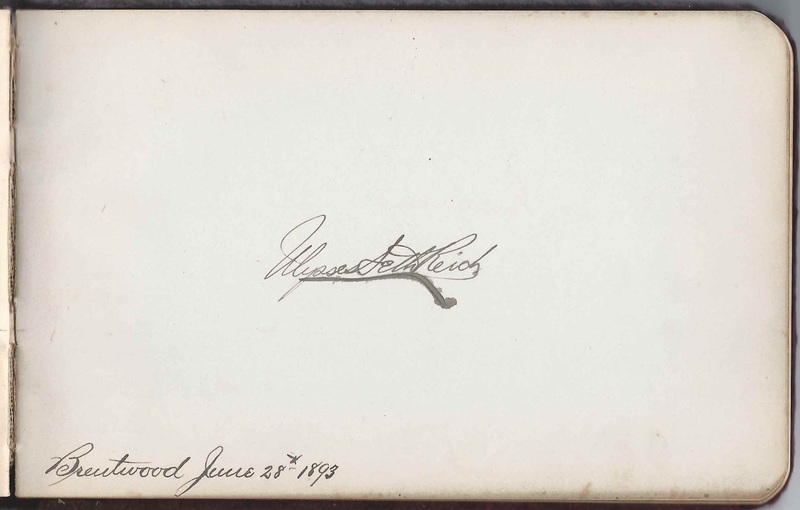 (Bennett) Leek, "Addie", signed the left facing page. 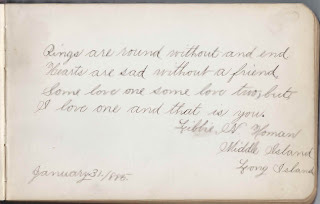 V. F. Mills, signed on May 23, 1885; not sure of initials.